DUBAI, UAE, June 10, 2015 -- Kofi Adu Domfeh, a member of the Pan African Media Alliance for Climate Change (PAMACC) and the coordinator for Ghana chapter has been announced the overall winner of the 2015 African Press Organization (APO) Energy Media Award. Domfeh was present in Dubai where the awards were announced the Africa Energy Forum taking place between 8-11 June 2015. He has also won a year’s access to over 600 airport VIP lounges worldwide. The APO Energy Media Award celebrates brilliant and inspiring stories about Energy in Africa. The subject matter may comprise a single topic or a variety of subjects, including – but not limited to – oil, gas, electricity, geothermal energy, hydropower, solar energy, wind power, nuclear, coal, biomass and more. Stories are judged on content, writing, analysis, creativity, human interest and community impact. Kofi Adu Domfeh’s report entitled ‘Future Concern is No Longer About Energy Security But Climate Change’ (http://www.apo.af/9iKBLw) stood out for the quality of the reporting, and the depth of analysis into Ghana’s efforts to diversify from fossil fuels and address climate change. Domfeh’s report also gave voice to the many opinions of African experts and advocates in the energy sector. 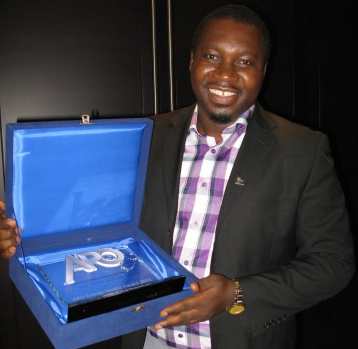 “We warmly congratulate Kofi Adu Domfeh for winning the 2015 APO Energy Media Award. We hope that this experience at the Africa Energy Forum in Dubai will be a memorable one for him", comments Nicolas Pompigne-Mognard, APO Founder and CEO.